Life for each of us is a roller coaster, filled with myriad choices and many challenges. Thoughtful, inspired guidance from a trusted source can make the difference between stumbling in the dark and striding toward the light during times of upheaval, both big and small. The Psychic Sisters is that source. Listen in each Thursday at 4 p.m. PST at www.12radio.com as the four talented, big-hearted sisters discuss the prevailing energy, chew over current events, and share witty, warm-spirited stories of their own magical moments. 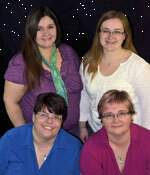 From a lengthy line of intuitives, Kristi, Katie, Kara and Ronda, are lifelong healers. They know love can transform and laughter can mend. Serious about helping listeners effect positive life changes, the sisters are by nature buoyant, bubbly souls. Join more fully in the fun and call them in the studio – or enter their rambunctious Facebook chat – during the show. Share in the love. Spread the love. Change your life. Help change the world. With her straightforward approach to problem solving, Ronda Knudsen gives The Psychic Sisters a blunt charm unique among shows of its kind. Kara Burrow’s endless empathy brings intense compassion to The Psychic Sisters. Exuberant, irrepressible Katie Weaver leads The Psychic Sisters broadcast, and her unflagging energy and optimism help ensure the proceedings are never anything less than enlivening. With her serene demeanor and keen insight, Kristi Brower anchors The Psychic Sisters radio team.